Over the past twenty years or more, I have conducted scores of interviews with people with personal stories to tell of Partition - the botched division of British India in August 1947 to created two independent nations, India and Pakistan. It produced one of the great tragedies of a deeply tragic century - at least half-a-million dead, ten million or more migrants, and the rupture of a symbiotic culture, most notably in Punjab. The tapes of my interviews are now held at the School of Oriental and African Studies in London. I will in time post more details of the interviews on this site. Many were used in a radio series I made in 1997, India: a people partitioned - the audio of those programmes is available online and on BBC iplayer. The historian Yasmin Khan also made excellent use of some of the material in her book The Great Partition. The interviews relating to Kashmir in 1947 provide the foundation of my own book A Mission in Kashmir. 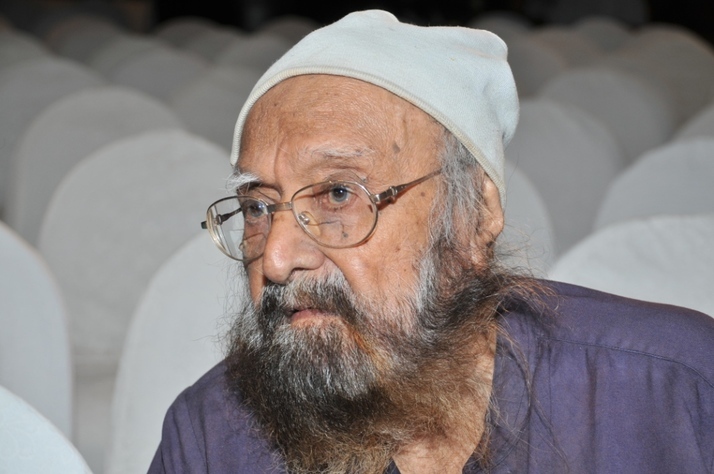 Khushwant Singh (1915 - 2014) was about the last of India's independence generation. He knew many of the key figures (Jinnah was chief guest at his wedding in Delhi in 1939) - he attended India's independence celebrations - he witnessed some of the partition violence - and in the novel Train to Pakistan, he was among the first to bear witness in literary form to the rupture and trauma of Partition. I spoke to Khushwant Singh in December 1996 about his memories of 1947. He was a marvellous racconteur, and spoke tellingly about seeing Lahore going up in flames, and his sense of guilt at not being able to do anything to prevent the communal carnage. He travelled by road in early August 1947 out of what was about to become Pakistan. As he was approaching Delhi, he came across a group of armed Sikhs who spoke chillingly about eliminating Muslims in their area. Train to Pakistan, Khushwant Singh told me, was set in a village - in the novel he called it Mano Majra - close to Lahore which he used to visit as a lawyer when he was representing in a murder case. 'It was a very enchanting village, largely Sikh owned with a few Muslim families. And that gave me the characters, the description of the village, and I located it along the river bank'. He talked of the models for the magistrate and for the communist in the novel (this latter was Danial Latifi, who I also interviewed). The central figure, he said, was 'based on my own Sikh servant, a boy of eighteen or nineteen, a very strapping young fellow, who couldn't care a damn about Pakistan'. Of all the interviews with people who lived through Partition, it's the memories of a friend's mother which I recall most acutely. This photograph is of my friend Shernaz (Shenny) Italia and her mother Khorshed Italia (nee Mehta). Mrs Italia lived almost all her life in a top floor flat in Connaught Place in the centre of Delhi. In 1947, she was a volunteer worker at Lady Hardinge Hospital, helping women refugees as they flooded in from Punjab, many of them alone and in profound shock. ​That interview is a deeply moving account of the trauma of Partition, and the violence inflicted on the region's women - and also an uplifting story of the way in which some found the strength to help those most in need. I have deposited the recordings and some transcripts of my Partition interviews at the archive of the School of Oriental and African Studies in London. There have been three deposits, the first two are briefly described here (scroll down). I have posted below over five pages a very basic listing of the contents of the first deposit - the full listing including partial transcripts runs to 334 pages and is held along with the tapes at SOAS. The second deposit in 2000 was much smaller - and the listing is also posted below. SOAS has a much more detailed 36 page list and transcripts of these recordings. The final deposit, made in 2009, is posted at the end of this page, and SOAS holds 255 page list with transcripts of these interviews and items. Khorshed Italia's memories feature in the radio series India: a people partitioned which sparked my interest in retrieving the memories of those who lived through Partition. The audio of Khorshed Italia's memories of her work as a volunteer in 1947 are posted here. Amrita Pritam captured in the poem 'An Ode to Waris Shah the suffering of Punjabi women at the time of Partition. I interviewed her in Delhi in May 1997 - she talked about writing that poem on a train journey from Lahore to Dehra Dun in the aftermath of Partition. She also spoke of the women abducted at Partition and of the children they bore to unknown fathers. It was a short interview, just fifteen minutes, but powerful and deeply emotional. 'I'm sorry, it is so painful to remember', she declared. In the radio series for which I interviewed Amrita Pritam, the third programme 'The Tearing of the Veil' begins with extracts from this conversation along with a musical rendition . The audio of that series is available elsewhere on this site. Amritra Pritam died in 2005 at the age of 86. Another unsettling Partition interview - for a very different reason. Shingara Singh was one of a handful of people I spoke to who showed no remorse for the violence he had perpetrated in 1947. He lived in Sultanwind, a village on the outskirts of Amritsar in Indian Punjab. He was a Jat Sikh, an old style patriarch, as Rosalind Miller's photograph shows - taken at the time of the interview in 1997. When we came to talk to him (I was accompanied by Asit Jolly who arranged the interview and translated to and from Punjabi) he was sitting in a charpoi in a wheat field he owned in the nearby village of Rampura, overseeing a group of labourers who were fitting a new tube well. By his own account, Shingara Singh was born at the close of the nineteenth century, and was already engaged to be married at the time of the Jalianwala Bagh massacre in Amritrsar in 1919. When he died in June 2009, he was described as the last survivor of the massacre. The interview I have posted here includes Shingara Singh's memories of Jalianawala Bagh, but the focus is on the anti-Muslim gang he was involved in at Partition, 'the crows'. He told me he had kept the best of his swords from that time, but they had been taken away in a police raid - it seems that some of Shingara Singh's extended family were caught up in the Khalistan movement. Shingara Singh interviewed near Amritsar in March 1997 talking about his involvement in communal violence at the time of Partition. Gopal 'Patha' Mukherjee was a goonda, a thug, who was part of Calcutta's underworld. He was also, in 1946-47, one of the key figures in the communal violence and retaliation which tore the city apart. By the time I met him in 1997 - accompanied by Nazes Afroz, who also translated to and from Bengali - he was old and frail, and by his own account aged 83. He died four years later. He had a house near Wellington Square, and we met in an adjoining room, which also served as a clinic for Mukherjee's rather grandly named NGO, the National Relief Centre for Destitutes. On the walls were garlanded black-and-white photos of Bengal's finest, but the commanding feature of the room was a life size model of Netaji Subhas Chandra Bose in uniform. Mukherjee, a Hindu, talked openly about his role in street violence at the time of Partition, and was proud of refusing to surrender any weapons to Gandhi. He explained that his nickname of 'Patha', goat, came from the family meat shop on College Street. I wrote a newspaper article back in 1997 based on my interviews with Mukherjee and others who lived through the Great Calcutta Killings of 1946 - it's available on the web - and there's also a wiki article about Gopal 'Patha' Mukherjee, which has further references. I interviewed him in March 1997, while he was foreign minister, about his memories of Partition. He was brought up in Jhelum, which became part of Pakistan, into a nationalist family and was active in politics even before he reached his teens. In the course of 1947, he was in Lahore and later Karachi. He attended meetings of Pakistan's Constituent Assembly, of which his father was a member, and on Pakistan's independence day saw Jinnah and Mountbatten in procession through Karachi. An upsurge of rioting in Karachi prompted the family to move to Delhi. His father was involved in helping retrieve abducted women. At least one child in his extended family was lost amid the Partition mayhem - but survived, and crossed over to India many years later. Mark Tully's obituary of I.K. Gujral in the Guardian is an excellent introduction to his life and career. The original audio cassettes are deposited at the SOAS archive, as mentioned above, along with notes, and partial and abridged transcripts of the interviews running to more than 300 pages. The original audio cassettes are deposited at the SOAS archive, as mentioned above, along with notes, and partial and abridged transcripts. In 1997, I compiled and presented a series of five radio programmes on the BBC World Service entitled ‘India: a people partitioned’. This was a social and oral history of the trauma of Partition as experienced by those across south Asia, and I was in the privileged position to be able to travel widely to conduct interviews and gather material. I deposited in the SOAS archive 83 audio cassettes of interviews, along with partial transcripts and notes and copies of the programmes as broadcast. The series was repeated in 2000, and to update the last programme in the series I conducted several further interviews and six more cassettes, numbered sequentially (that is, tapes 84 to 89), were also deposited at SOAS. I am delighted by the use that has been made of this resource, most notably by Yasmin Khan in her book The Great Partition. · interviews relating to the invasion of Kashmir in October 1947 conducted as part of the research for my book A Mission in Kashmir which was published in India by Viking Penguin in November 2007. Some of this material was also used in a Radio 4 programme ‘An Incident in Kashmir’ which is also included in the deposit. There are also a few interviews conducted since moving back to Britain in the summer of 2007. In all cases, those interviewed knew that their words were likely to be in the public domain. There was no concealed recording and no concealed purpose. Some interviews were conducted on my behalf by colleagues, and I would like to acknowledge their kindness and professionalism. In all such cases, the name of the interviewer is included in the notes that follow. Most of the transcripts were made by me to help in the making of programmes and the writing of my book on Kashmir. They are not flawless, and they should not be takes as a full and authoritative record. I am happy for brief written extracts from these interviews, that is up to 50 words, to be published subject only to proper acknowledgement. The publication of longer extracts, or the broadcast in any form (including on the internet) of any of the audio on these CDs, requires my advance written approval. Copyright of the radio programme included in this deposit rests of course with the BBC. Anima Dasgupta speaking at the London home of her friend Ralph Russell about memories of Communist activism in Bihar and Calcutta during the Ranadive period of the 1940s. Sir Peter Scott on working at the Viceroy's office 1946-7. Recorded by Clare Jenkins. Bapsi Sidhwa and Urvashi Butalia (both Delhi) in discussion with AW in London. This formed the basis for an abridged transcript published in History Workshop Journal, 50, 2000. Karan Singh was the teenaged crown prince in 1947 - talking about his memories of that time. Pran Nath Jalali on Kashmir in 1947 - Quit Kashmir, pro-NC movement in Kashmir, role of Communists, and of the NC-aligned militia. More on role of CP in Kashmir nationalist movement, jail on independence day, militia, and identifying militia members in pamphlet photo. Air Chief Marshal Arjan Singh, born in Lyallpur and in charge of the Ambala flying training station in 1947, on Partition. Krishna and Mohan Lal Misri talking about Srinagar in 47 and esp the NC militia and women's self-defence corps - and identifying people on Kashmir pamphlet cover. Mehmooda Ahmed Ali Shah and Sajida Zameer Ahmed (nee Malik) talking about Kashmir in 47 and particularly the CP and women's self-defence corps. CD of Radio 4 programme ‘An Incident in Kashmir’, compiled and presented by Andrew Whitehead – broadcast August 2003.